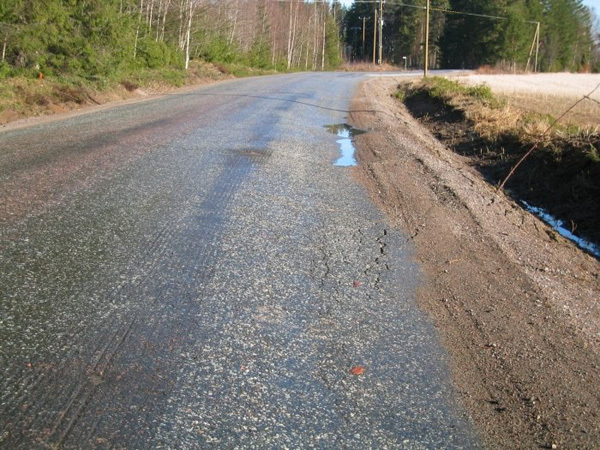 A key step in improving the condition of a road suffering from permanent deformation is a precise and reliable problem diagnosis. All of the subsequent decisions for rehabilitation measures will depend on it. 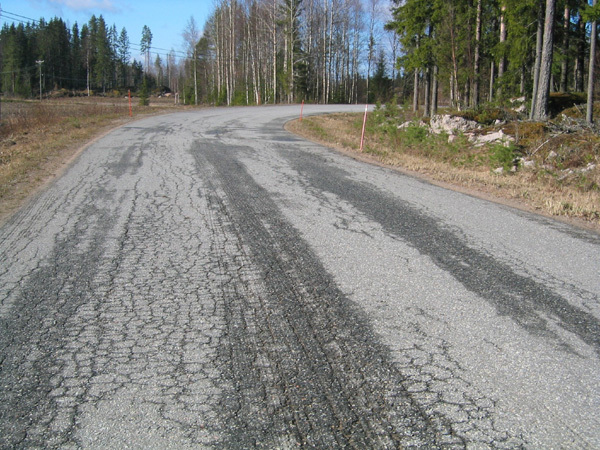 Permanent deformation can take place in the road surface layers, in the deeper road structures, or in the subgrade. In addition, material quality, drainage condition and frost and freeze-thaw cycles, as well as loading, can all have a major impact on where permanent deformation occurs and how severe it will be. The diagnosis of the underlying reasons for permanent deformation can be difficult. 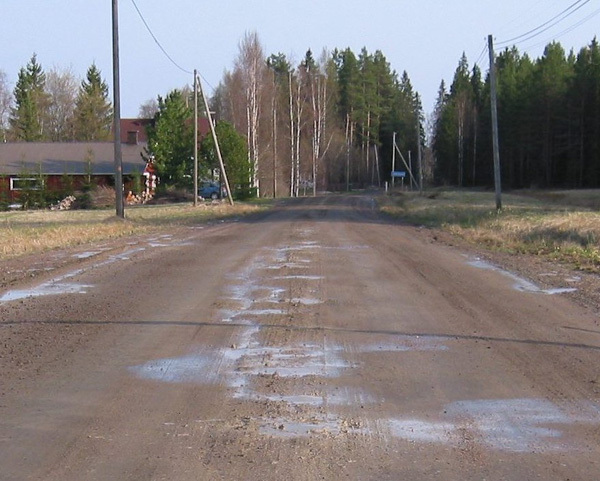 In this video from Finnish Lapland the form of the ruts indicates that the problems are located close to the surface but the video also shows that the subgrade is weak peat and that the ditches are full of water indicating that road drainage is not working properly. For all of these reasons it is very important to classify all of the parameters affecting permanent deformation before any decisions are made. In this lesson 4 different kinds of rutting modes will be described. 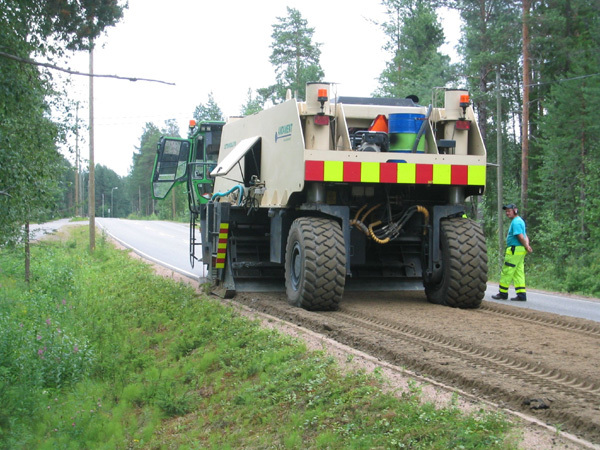 Mode 0 rutting takes place through the compaction of the non-saturated materials in the pavement structure, and in practice some level of Mode 0 compaction always takes place in a road structure after its construction. 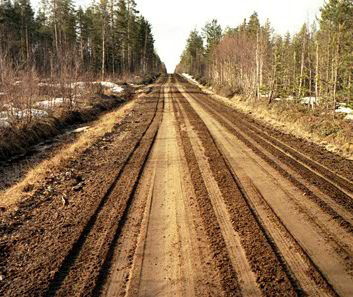 Normally the construction compaction prior to trafficking is sufficient to prevent further compaction under trafficking. This mode of rutting is usually self-stabilizing - i.e. the compaction that happens prevents further compaction. It also causes the compacted material to stiffen and thereby spread load better. Better load spreading leads to a reduced stress on the subgrade, thereby reducing the risk and amount rutting at that level (see Mode 2). 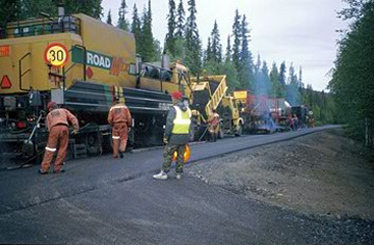 The formation of Mode 0 rutting due compaction of road structure. 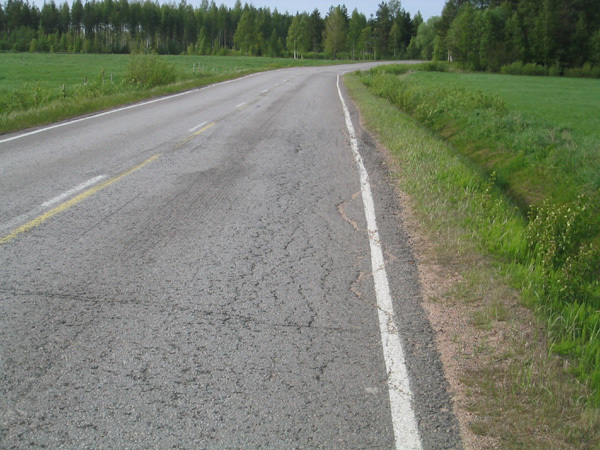 Rutting of this type is normally seen as a narrow depression in the road surface relative to the original surface. The material affected is mostly near the wheel path and a limited amount of this form of rutting can be beneficial. Good compaction will minimize the amount of Mode 0 rutting observed. 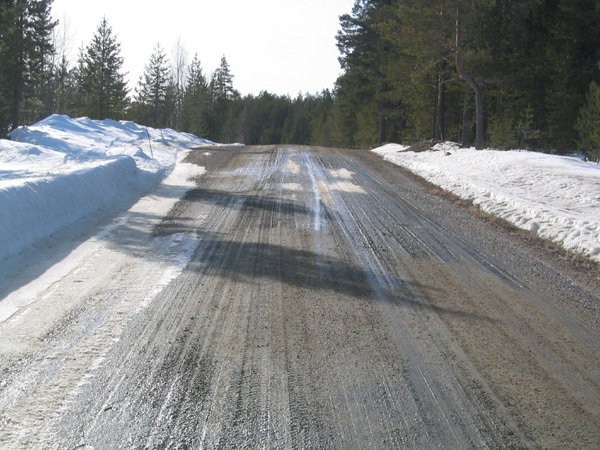 In regions affected by frost penetration in winter, the frost, in combination with moisture, causes a small expansion within the materials of the road structures and a bigger expansion in any frost susceptible soils in the subgrade. This expansion later produces by de-compaction of the aggregate layers and subgrade soil during the thawing period. 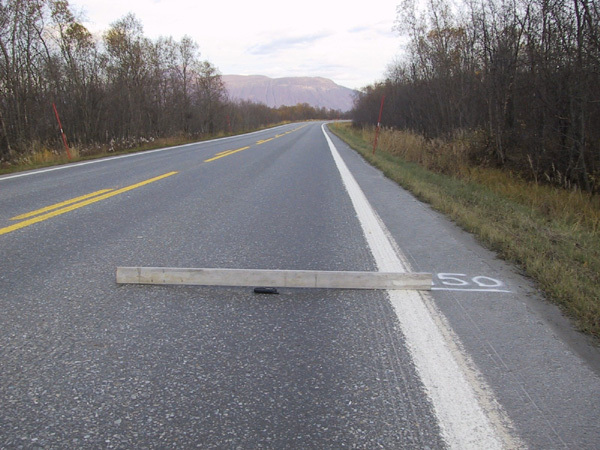 ROADEX field tests have shown that frost heave, or volume expansion, due to freezing in road structures can vary from 50 – 80 mm. This means that, in the spring, when the frozen aggregate and subgrade thaw, compaction can become possible allowing Mode 0 rutting to develop. 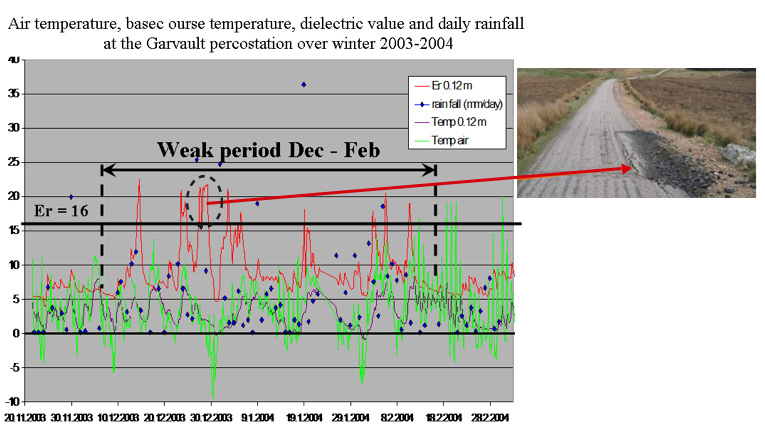 The natural variability of subgrades can lead to variable heave along the length of the pavement and, as a consequence, variable rutting. Shear deformations (discussed below as Mode 1) may also accompany the spring-thaw as any loosened aggregate will be significantly weaker than in its compacted state. This can lead to unacceptably large ruts after several years of spring-thaw. Mode 1 rutting happens in weaker granular materials where local shear occurs close to the wheel. This gives rise to dilative heave immediately adjacent to the wheel track where the granular material can undergo large plastic shear strains and consequent dilation, leading to relatively loose material. 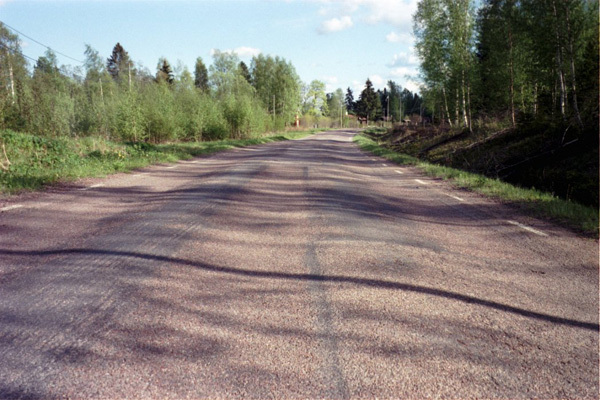 This type of rutting can therefore be considered to be largely a consequence of inadequate granular material shear strength in the aggregate near to the pavement surface. The formation of Mode 1 rutting. 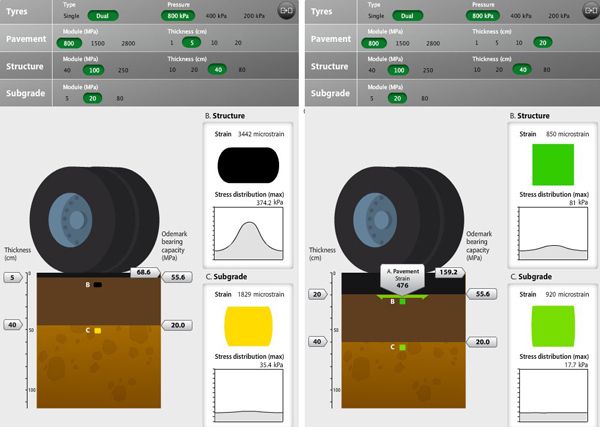 Evidence from both trial pavements and from theory has demonstrated that the maximum shear in Mode 1 rutting is felt at a depth of approximately 1/3rd of the width of the wheel (or width of the wheel pair where twin tyres are used). In pavements with significant traffic wander (ie in wide lanes, roads with no markings, roads without existing ruts) the depth may even be a little deeper. 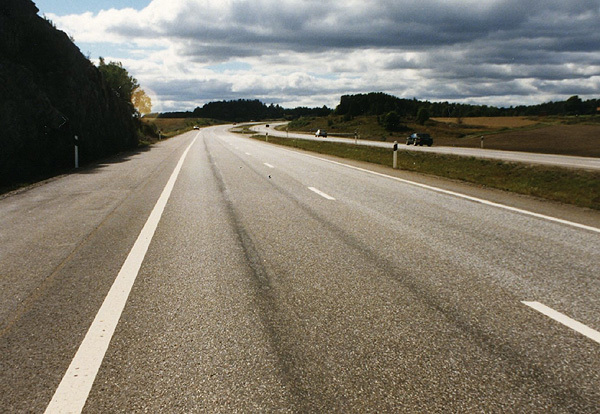 Similarly, in pavements which have a significant asphalt layer the critical depth is likely to be deeper than a third of the wheel width from the surface due to the effects of the asphalt in changing the stress distribution within the pavement. Research results from the ROADEX II project have shown that in general the most critical depth is at a depth of approximately 150 mm from the pavement surface. 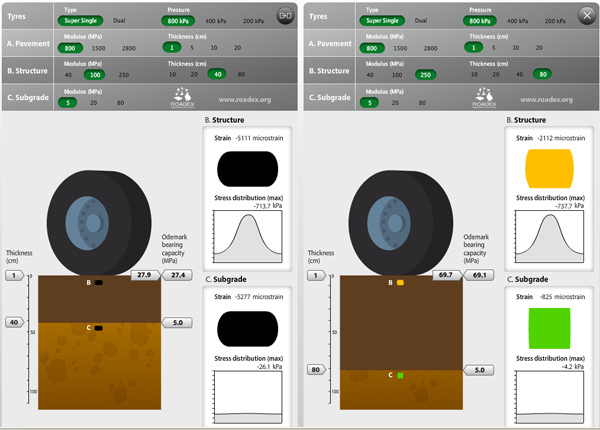 The depth of maximum shear in Mode 1 rutting under super single or twin tyres. Mode 1 rutting can be seen in the following figures. Note the characteristic shoulder heave evident in the pictures. Internally, such a pavement may look as in figure. Here the local shear causing the "shoulder" is clearly visible and there is no subgrade deformation evident (the yellow lines have been sprayed on to clarify the boundaries in the picture). 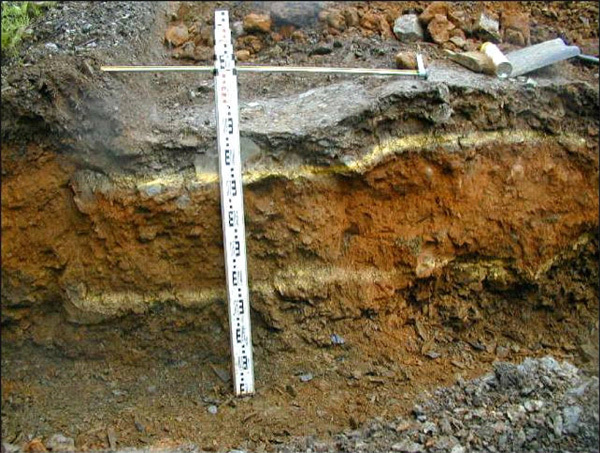 Ideally in Mode 1 rutting there would be no deformation at the subgrade surface and this type of deformation can be regularly seen when the subgrade is strong bedrock. The photograph also shows a typical feature that can indicate Mode 1 rutting, i.e. small diameter net cracking (or alligator cracking) in the overlying asphalt. 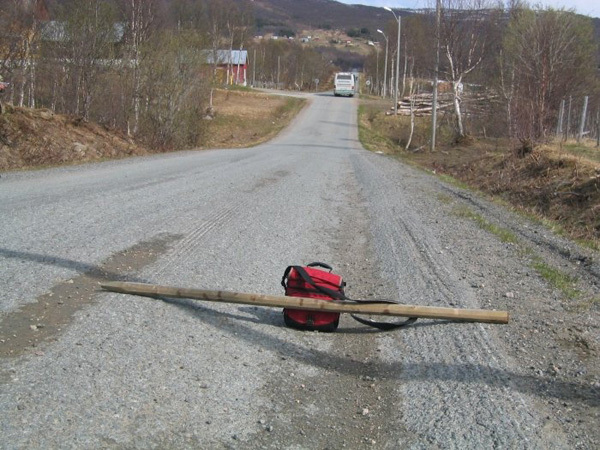 This type of rutting is frequently observed in Nordic areas affected by seasonal frost. In many cases in these areas Mode 1 rutting is the main contributor to the accumulation of rutting, especially where a poor quality aggregate with excess moisture content completely loses its load carrying capacity when it thaws in the spring. The same material when re-compacted, (see Mode 0 rutting) and drained, can have an entirely adequate performance for the rest of the year. Mode 1 rutting is also common when locally available, variable quality aggregates are used. 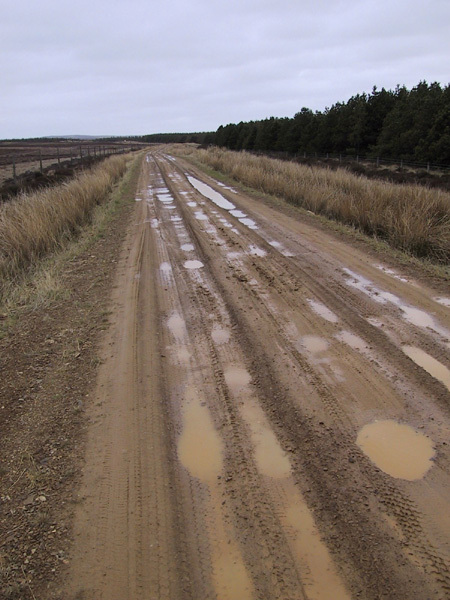 This also happens where unsealed roads (gravel roads) are trafficked in wet conditions. b) reduce the stresses imposed by the tyre, by covering the structure with better material, ie with better aggregate or asphalt. by stabilization or treatment with non-traditional additives, by the use of a steel net or geosynthetic reinforcement, or by improving the conditions which control its behaviour, e.g. by drainage. If none of these solutions is effective the aggregate may have to be replaced. 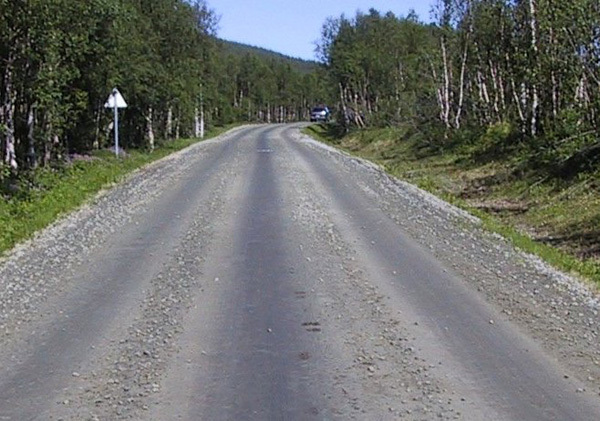 Mode 2 rutting occurs where the aggregate quality is better and the pavement as a whole ruts. This can be viewed in an idealized fashion as the subgrade deforming with the granular layer(s) deflecting bodily on it (i.e. without any thinning). 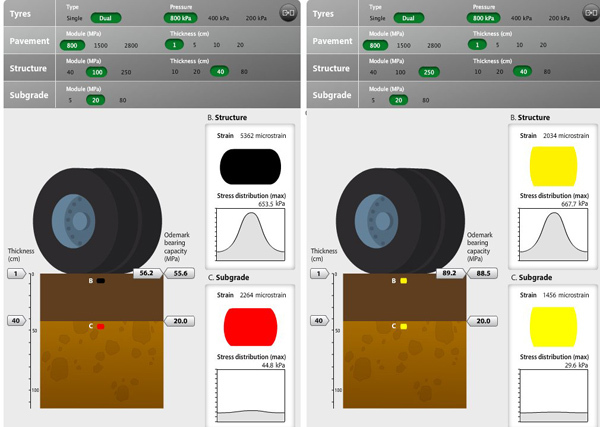 In Mode 2 rutting deformation takes place at the road structure – subgrade interface. The surface deflection pattern of Mode 2 rutting takes the form of a broad rut with slight heave remote from the wheel (as it is the displacement of the soil which causes this). A good example of this type of failure can be seen in figure. In this case the surface rut has been repeatedly infilled, but rutting at the subgrade surface has continued with the new aggregate following the shape. 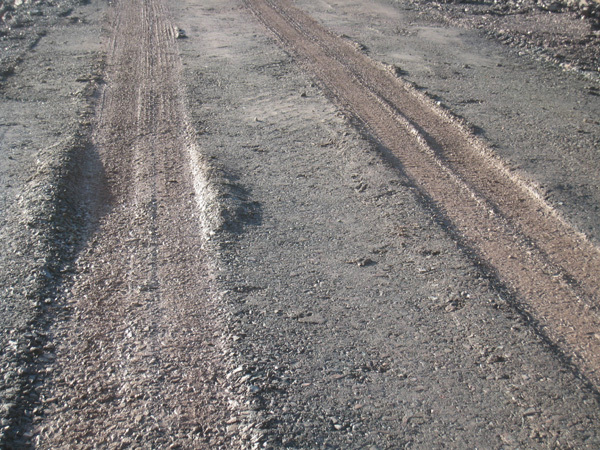 The subgrade has had to squeeze upwards between the wheel tracks and in the margin – a very advanced example of the rotational shear within the subgrade. 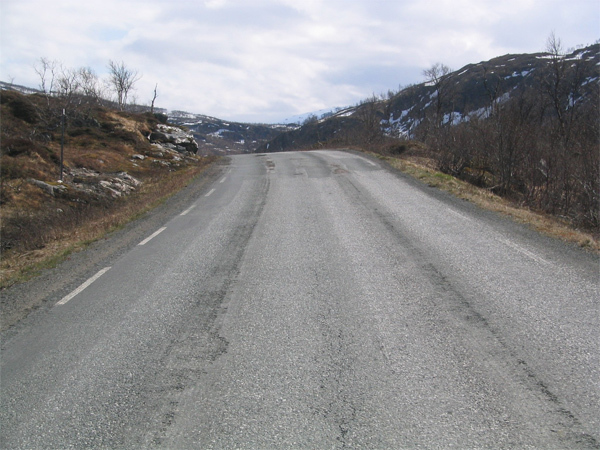 Mode 2 rutting generally occurs in wider areas of the road cross section than Mode 1 rutting. In regions affected by deep seasonal frost, the spring thaw problem discussed in Mode 1 above can lead to Mode 2 rutting in the subgrade. 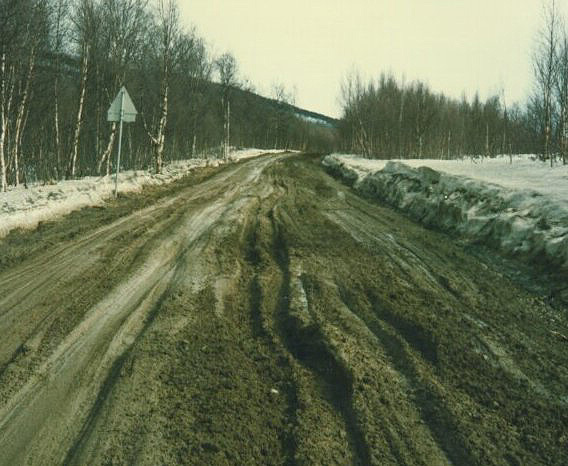 In such situations, excess Mode 2 rutting may be seen in the spring when subgrades are softened for a few weeks by excess moisture consequent upon thawing. 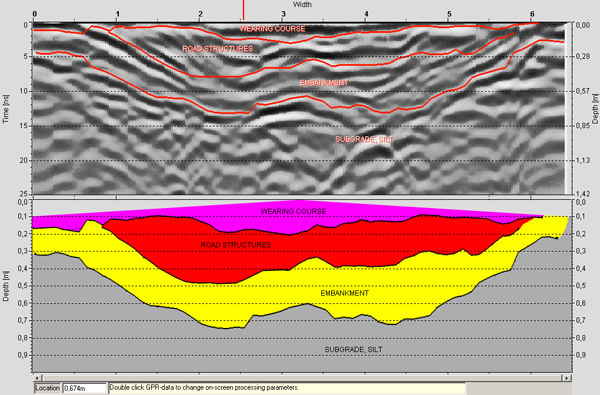 Figure shows a Ground Penetrating Radar (GPR) cross section of Mode 2 rutting. If FWD data is available Mode 2 rutting can also be identified through low subgrade moduli values and high BCI values (see the lesson on Survey and Monitoring techniques). 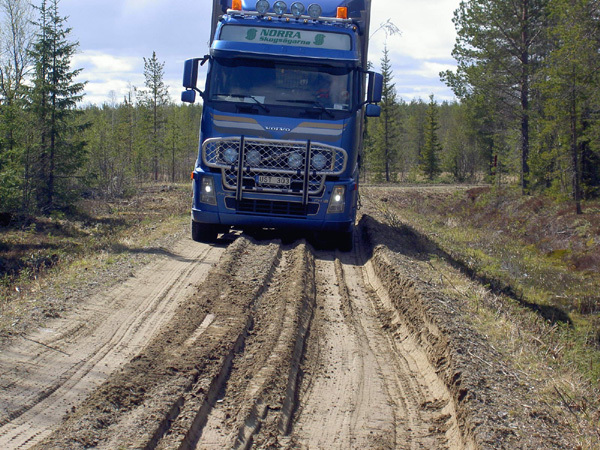 The key issue in preventing Mode 2 rutting from happening is to reduce the intensity of stresses transmitted to the subgrade from the road surface. This can be achieved by increasing the thickness of the structural layers. If this is not feasible e.g. 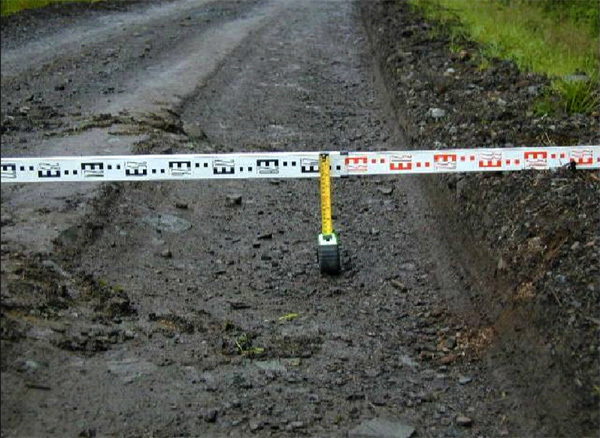 due to the lack of good quality materials being available or because of the risk of consolidation settlements, the load spreading capacity of the pavement structure can be improved by installing a steel grid reinforcement at a depth of 200 to 300 mm below the road surface or by stabilizing the base course layer. These measures are, however, normally not as efficient as increasing the layer thickness. 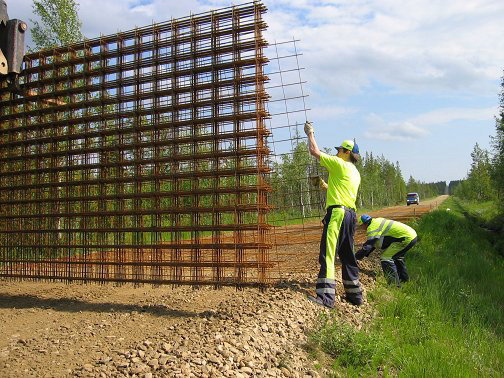 A very good solution against Mode 2 rutting is to install a steel grid inside the road structure. The steel grid increases the tensile strength of the structure and spreads the truck wheel load over a wider area. 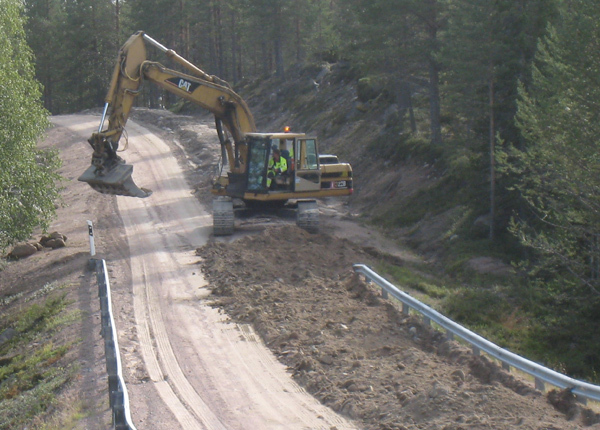 This reduces the critical stresses and strains at the road structure/subgrade interface. The formation of Mode 3 rutting. 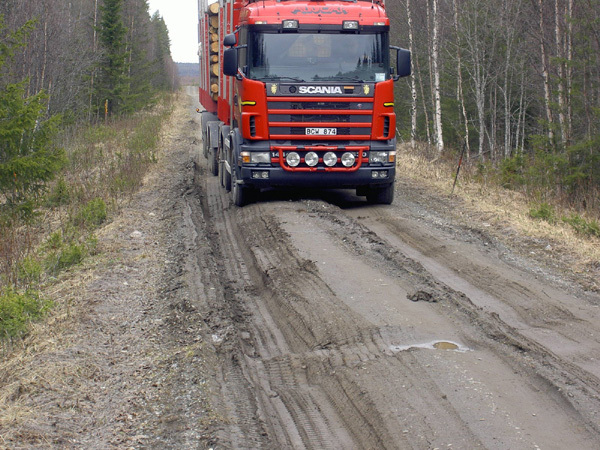 Ruts are developed due to tyre wear on the pavement of a paved road, or the wearing course of a gravel road. 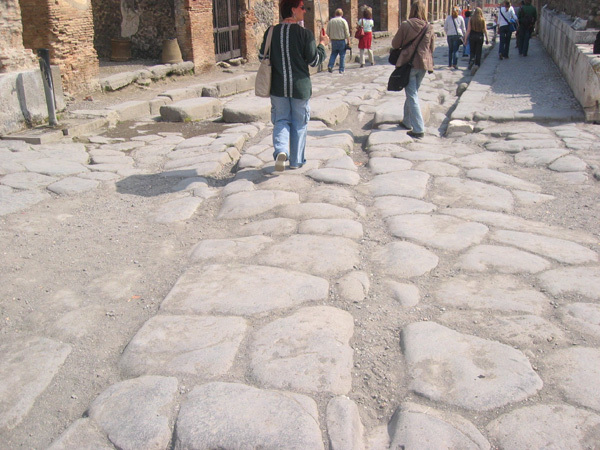 Mode 3 rutting, otherwise known as pavement abrasion, was a known feature as far back as ancient Rome as seen in photograph taken from Pompeii. 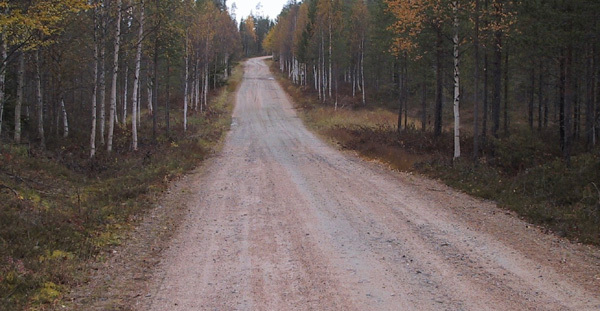 However in the Northern Periphery Mode 3 rutting is mainly due to the wear of the pavement due to studded tyres. 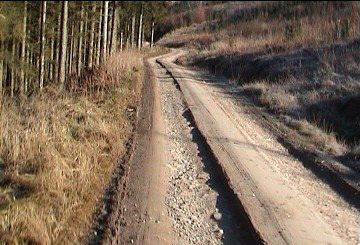 Wear in gravel roads can also take place if the wearing course material has insufficient fines to bind the aggregates together (gravel loss). However in low volume roads Mode 3 rutting is hardly ever present and can generally only be seen when the AADT is more than 3000 vehicles / day. 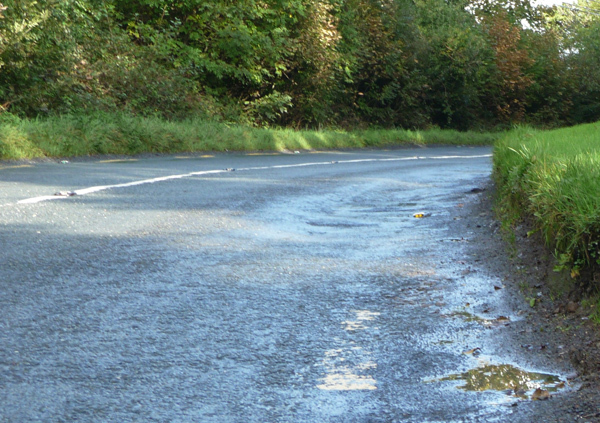 Mode 3 rutting can be identified by sharp shaped ruts, with rut distances similar to passenger vehicle wheel spacings. Profilometer surveys in Sweden have provided excellent information on rut shapes that have been used to separate Mode 3 rutting from Modes 1 and 2. If the distance between the bottoms of the ruts is short, like car axles, the rutting is Mode 3 and if the distance between the ruts is wider, like truck axles, the rutting is Mode 1 or Mode 2. 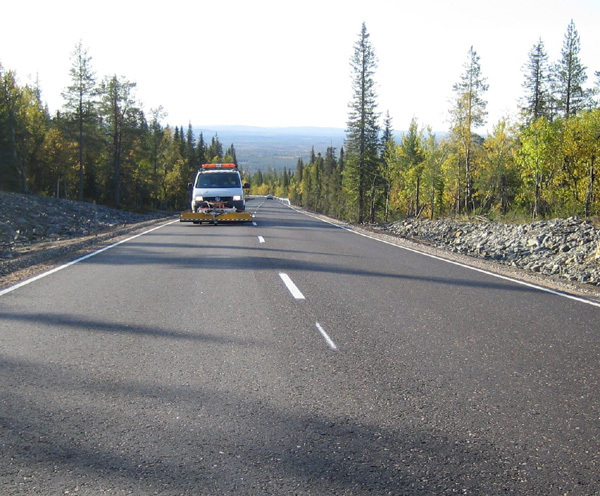 There are 2 general solutions to Mode 3 rutting problems: a) the use of harder rock aggregates with high resistance against wearing in asphalt pavements or b) a ban on the use of studded tyres. 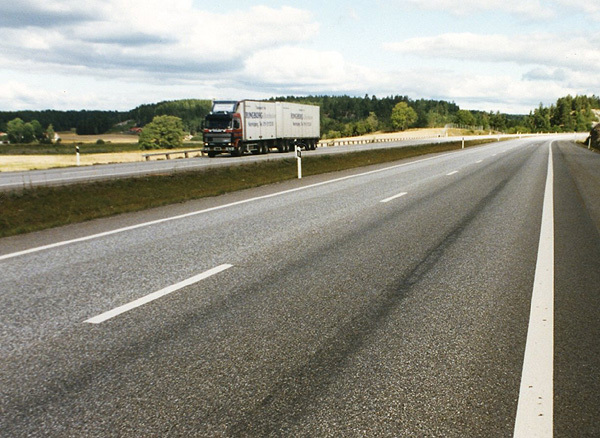 The first solution has been used in Scandinavian countries (Finland, Sweden, Norway and Iceland) where studded tyres are still in common use. On gravel roads Mode 3 rutting can be handled. 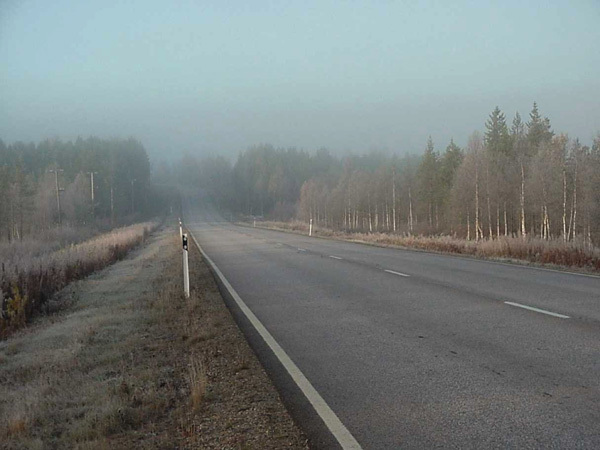 In practice rutting on a typical road will be a combination of Modes 0-3. 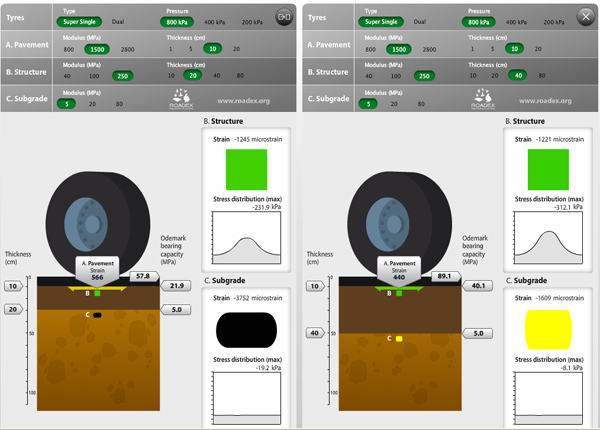 For instance excavations across some trial pavements in Scotland have shown both thinning of the granular layer (Mode 1) and depression of the subgrade (Mode 2). 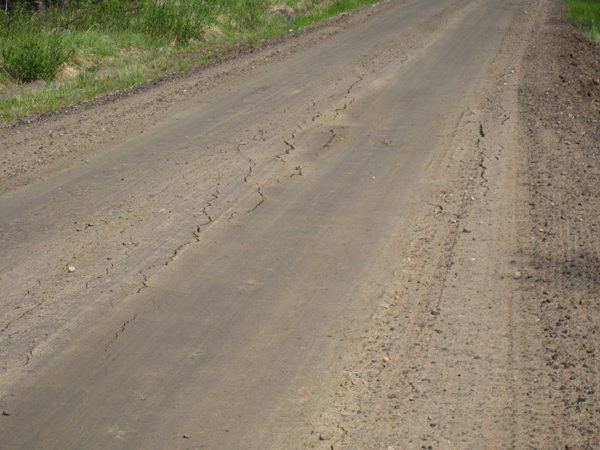 The localised heave (or "shoulder") close to the wheel path is clearly visible as is the reduced deformation of the subgrade compared to the surface depression. The formation of combined rutting modes. It is expected, and to some extent observed, that Mode 1 rutting will be more evident with channelised trafficking, e.g. with forest roads which are only one vehicle wide. In such circumstances wheel wander will not be available to repair rutting by displacing the aggregate back again and re-compacting it (Mode 0). 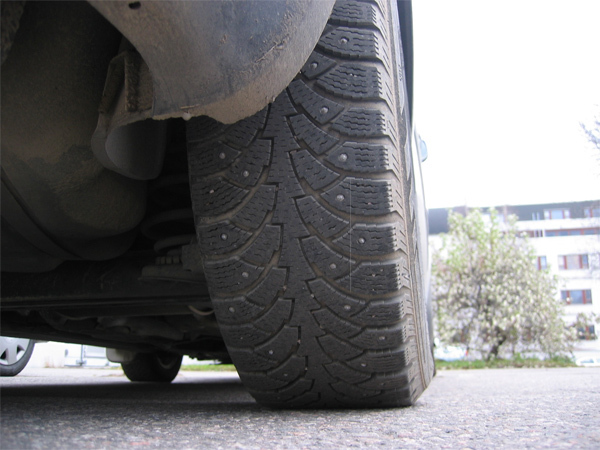 Mode 2 rutting is more likely under wandering traffic, with Mode 0 making a contribution as the "kneading action" of a wandering tyre is more effective in achieving compaction. When considering a solution for a combined rutting mode in a non-frost area it is important that the underlying problems are fully understood. In particular the primary reasons for the problems should be clearly identified and the solution selected should take care of the identified problems. A drainage condition analysis and improvement should also always be done at the same time. On some occasions erosion can be a reason for rutting. 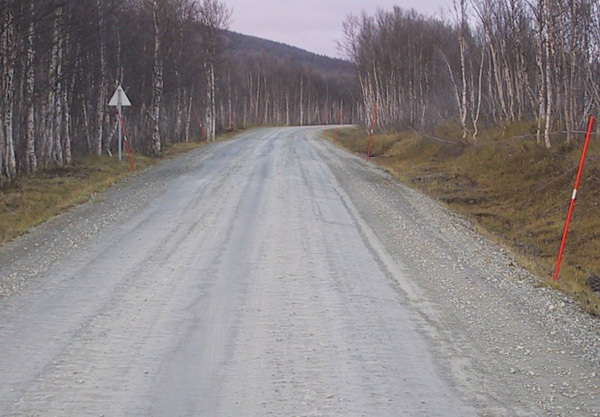 The low volume roads of the Northern Periphery are very vulnerable to permanent deformation especially where seasonal frosts, and daily freeze-thaw cycles, add to the levels of permanent deformation that take place in the road materials and subgrade soils. The reason for this is the strong cryo-suction force that arises at the freezing front. This has the capability to adsorb and trap water molecules far beneath the freezing front if there is free water available. This can expand the pores and loosen the aggregate. When this material then thaws, excess water is produced in the layer that makes it weaker and thus sensitive to permanent deformation. 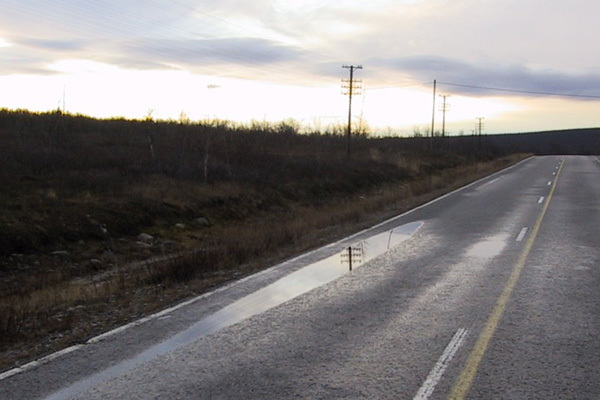 Water and thermodynamics are discussed more detail in the Lesson on “Drainage of Roads”. An animation showing the effect of cryo suction and moisture flow on pavement performance during and after a freeze-thaw cycle. 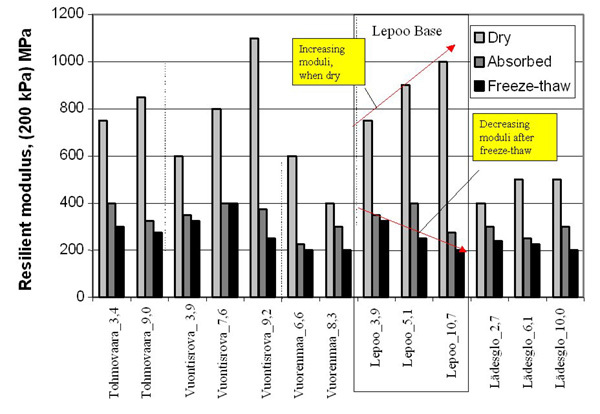 The figure below presents some results from a series of laboratory tests carried out at the Tampere University of Technology that show deformation after a freeze-thaw cycle is substantially greater in a moist specimen, representing autumn conditions, than a dry test, representing summer values. 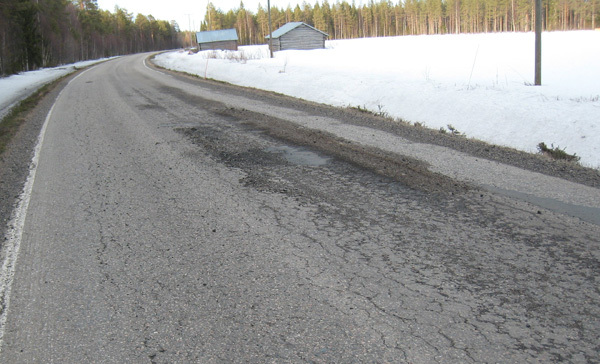 It can be estimated that 60 – 80 % of all damages that appear on roads can be related either to freeze-thaw cycles or spring thaw period. 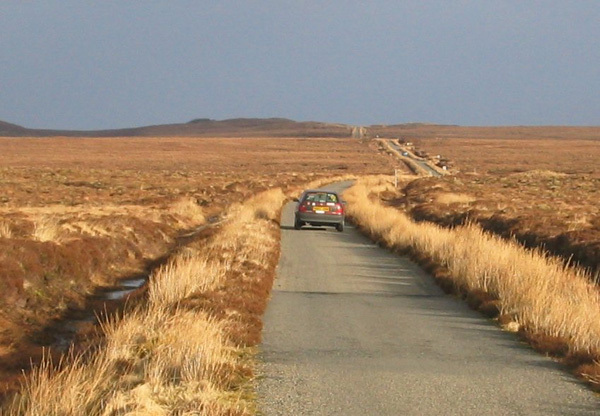 In areas of only freeze-thaw cycles and limited frost penetration, like the Highlands of Scotland, the rutting modes, caused by freeze-thaw, are mainly Mode 0 and Mode 1. 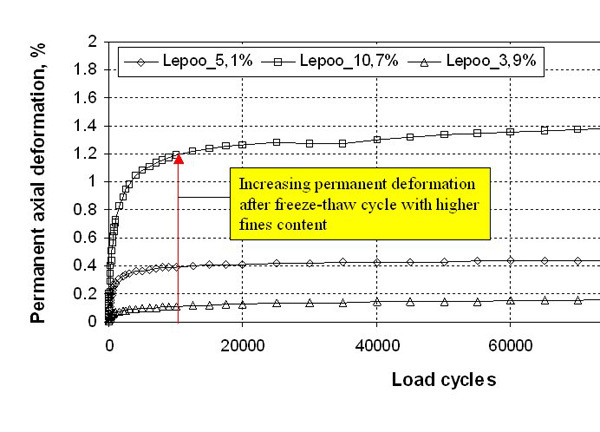 Mode 0 rutting takes place when the water between the material particles freezes and causes a slight increase (heave) in the volume of the material. After the heave has passed, the aggregate moves back into a compacted condition. This volume change generally recovers however, even on unloaded sections, due to weight of the layers above. The more serious problem is Mode 1 rutting that takes place mainly in the unbound base course after a freeze-thaw cycle. 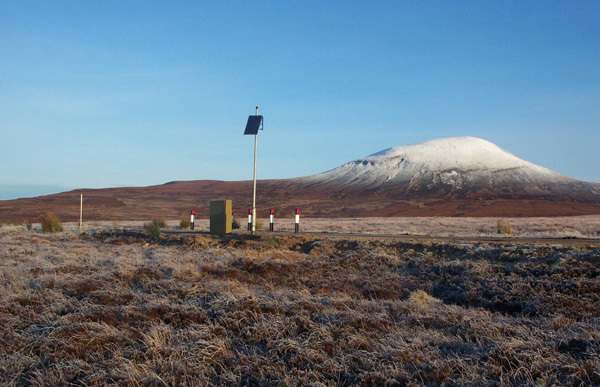 The ROADEX II Percostation monitoring results at Garvault Percostation in Sutherland, Highland showed that the road was sensitive to failures particularly after 2-3 frost nights with a following rainfall. In those areas where the frost penetrates down to the subgrade, all of the rutting modes and deformation types can be seen, especially during the spring thaw period. 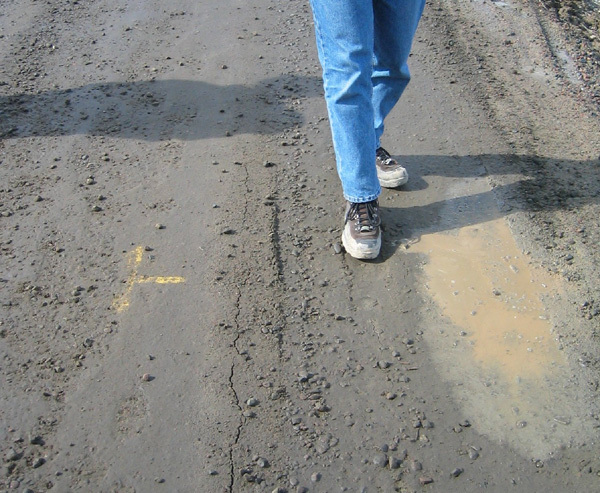 In these areas any permanent deformations appearing should be understood in the context of frost heave and thaw settlement on the road structures and subgrade soils. 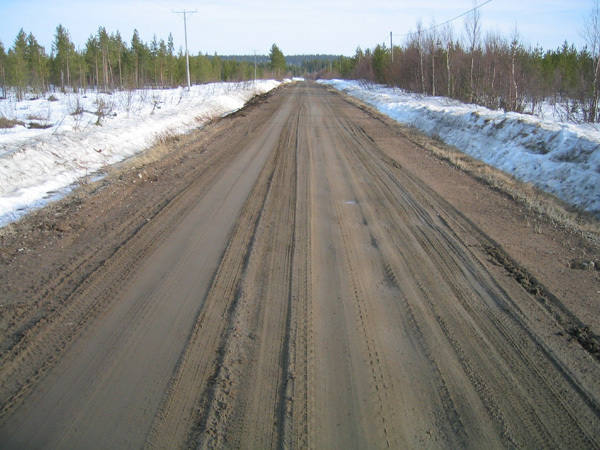 During the thawing period the road structures will have Mode 0 and Mode 1 rutting. 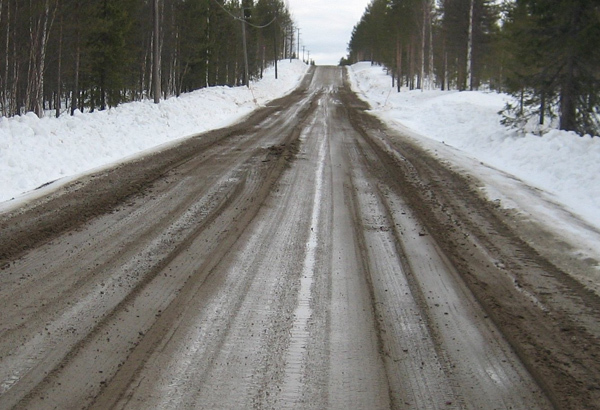 When the thawing reaches down to the subgrade, and heavy traffic loads the road, Mode 2 rutting will take place. At the same time, due to the load of the road embankment and traffic loading, any plastic subgrade soil present will often flow to the road sides causing a widening of the road. This animation is based on the monitoring results from the Tohmo Percostation site in Kemijärvi, Finland. 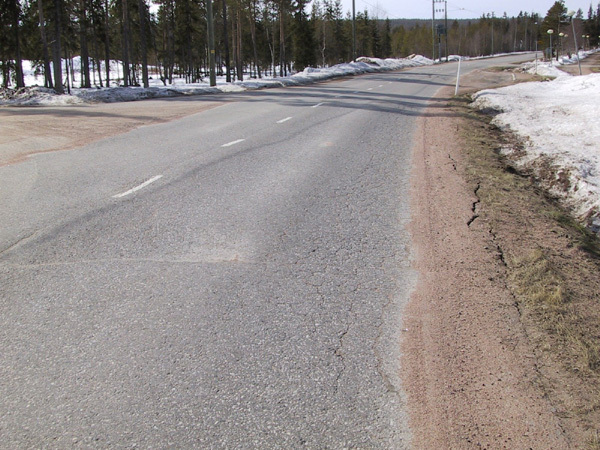 It shows the frost heave and thaw in the road structures and subgrade soils over the course of one year. As a result of this process low volume roads regularly get wider and have very weak shoulders. 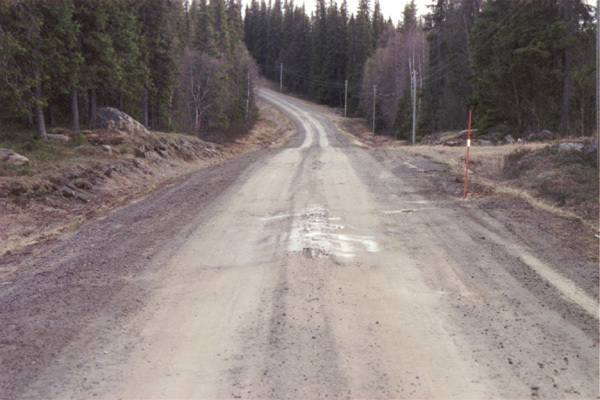 Where it is considered that the main reason for rutting is seasonal change the road should first be checked if it has any frost heave problems. 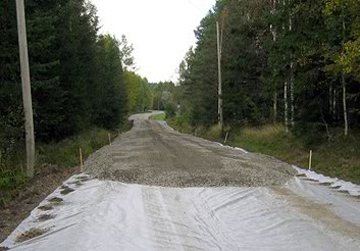 If the road is located on a non-frost susceptible subgrade and the main rutting mode is Mode 1, then the recommended solution is stabilization, or an improvement of the base material quality. 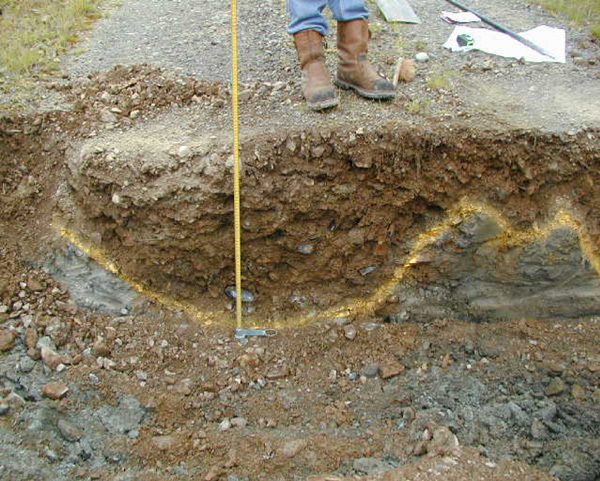 Stabilization can also be considered where the subgrade is frost susceptible, but without differential frost heave problems, and Mode 1 rutting problems can be seen. “In situ” crushing and homogenization can be an option where the road make-up contains large quantities of boulders. This method, called “the Tirkkonen method” in Finland, homogenizes the structure to a depth of up to 50-60 cm by crushing the large stones, thereby improving the grain size distribution and resistance against permanent deformation. 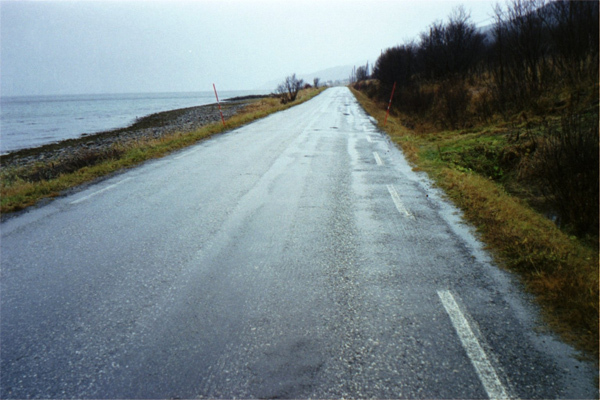 A thicker road structure can also be considered as a very good option, as a thicker layer can reduce frost heave. 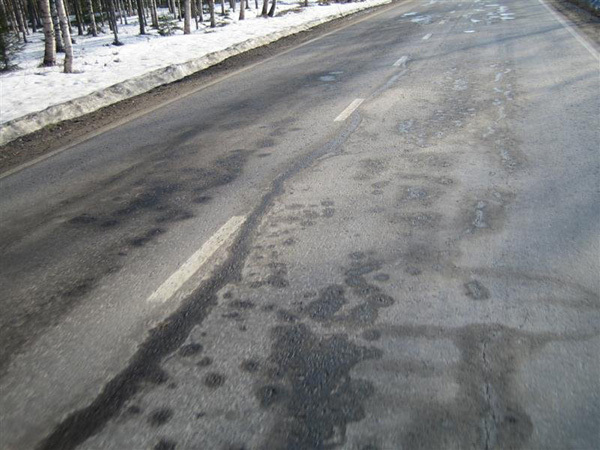 The recommended solutions for road sections with differential frost heave problems are: a) a thicker structure, b) soil replacement with a new structure, or c) the use of a frost insulation structure. Pumping is a special process which can, indirectly, give rise to permanent deformation problems particularly where the road is constructed on a very wet subgrade. 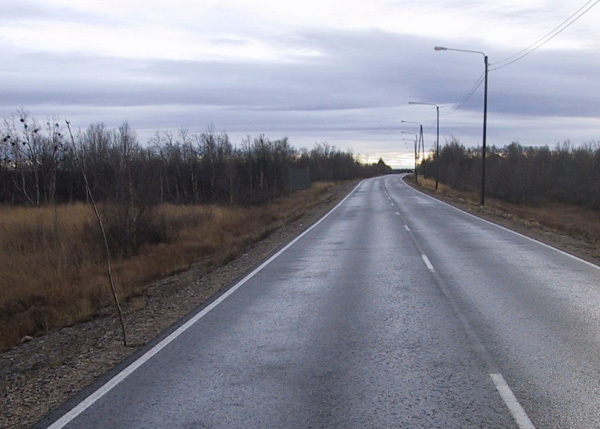 The thin structural layers of a low volume road may not always be able to spread traffic loads efficiently enough with the result that fairly high stresses can be imposed on the subgrade. The combination of vertical loading and shear loading caused by the traffic in these circumstances can cause the aggregate layer to “knead” the surface of the subgrade, like a baker kneads dough. Because the subgrade is saturated with water, it is practically incompressible and, under this combined loading, excess pore water pressure may develop. If the subgrade is of low permeability, the only way for the excess pore water to escape is towards the roads surface, i.e. into the structural layers of the road. 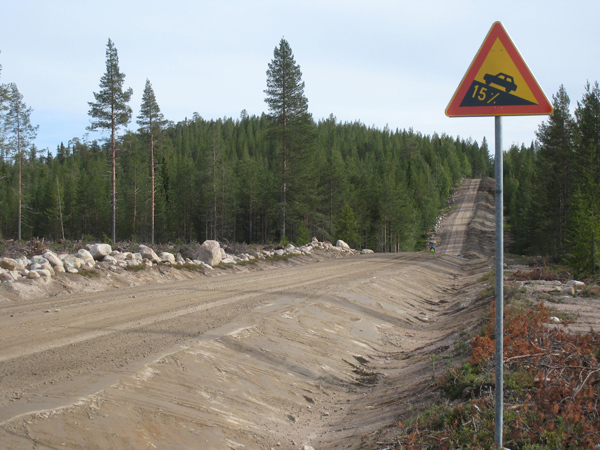 With repeated trafficking, the continued resilient movement of the aggregate causes the pores in the aggregate to repeatedly open and close, thereby creating a "pumping" effect that forces the water up into the overlying road structure. An animation to show how pumping happens under a moving wheel load. On peatlands the loading may also cause some subgrade compression causing the release of some of the very high water content in the peat. This will result in subgrade rutting, but not strictly Mode 2 rutting as subgrade shear will not be the primary cause. Rather it will be a consequence of repeated loading of the truck axles and the slow recovery time after each axle load pulse. Where the subgrade has low plasticity (i.e. where it is fine grained and rich in silt), consolidation is unlikely but the combination of the kneading effect and the high water content may allow fine particles to separate from the subgrade, leading to a slurry in water. Little-by-little this slurry can be pumped up further and further through the aggregate. As this happens, the stones in the aggregate layer can become coated in clayey and silty fines and the aggregate layer become weaker. This allows the kneading action to become stronger. Soon, the whole base layer can be contaminated with fines. On both of these subgrade types a weakened aggregate base layer results and Mode 1 rutting can then be expected. In seasonally frost-affected regions, pumping may be observed during the spring-thaw even though it is absent during the rest of the year. In this case, the excess water in the aggregate base layer due to spring-thaw activity, both reduces the strength of the base layer, promoting an increased kneading action, and also provides free water to saturate the base layer. This potentially allows any fine material to be pumped up through the layer. The cheapest solution for pumping problems is to manage the recovery time of the road by ensuring that there is sufficient time between consecutive vehicles to permit the aggregate layers time to recover. 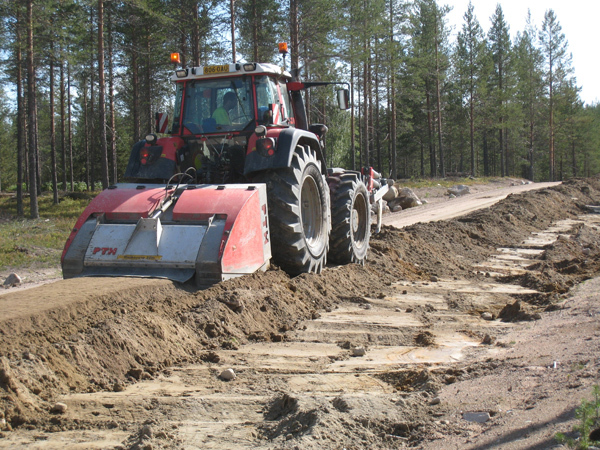 On peat and silty subgrade areas, a good solution to pumping problems has been the installation of a steel grid at a depth of approximately 250 mm from the road surface. This reduces the deflections under the wheel load and thus pumping. 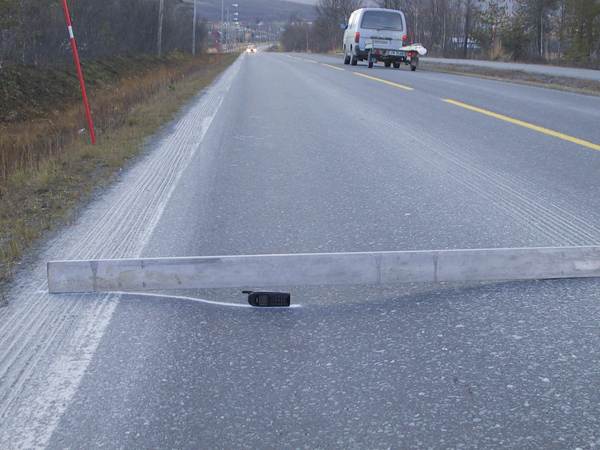 A geotextile may also prevent hydraulic flow and pumping of fines to the upper part of the pavement structure. Another solution that has been tested has been the provision of a coarse, open grained layer under the base course. 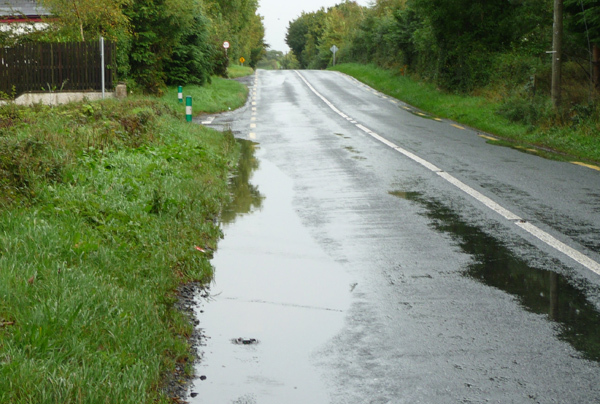 This helps to drain the excess water to the side of the road instead of pumping it up to the surface. In some forest roads this layer has been made of chopped bark.